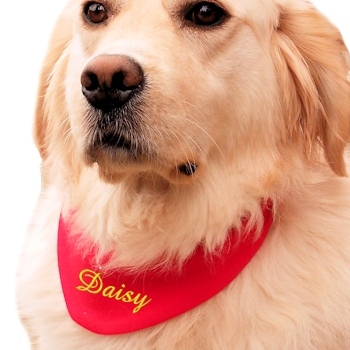 Personalised cotton bandanna bib scarf for your favourite pet. Double thick sturdy bandanna made in the UK from durable cotton jersey material. Has a Velcro fastening and fits most dogs. Enter the name or wording you want embroidered on the scarf and choose the thread colour and font style you like best for the text.